"She'd never met anyone like him. He's never met anyone... Period." A lighthearted romantic comedy starring Brendan Frasier as the lead character of Adam. The story begins during a time when the cold war was a real threat to the American way of life. In an effort to protect his family, Calvin Webber, played by Christopher Walkin, builds a very elaborate shelter underneath his house. The shelter contains all the comforts of home and is stocked with everything the family would need to survive for a very long time. One day the warning sirens go off and Calvin takes his pregnant wife to the shelter where he locks both of them inside for safety. Soon after the couple are locked into their underground home, Mrs. Webber gives birth to a son, whom they name Adam. While the Webber family are safe and sound in their underground home, the rest of the world carries on without them. Calvin is fearful of going out of the shelter because he believes their will be lingering radiation from the war, which never took place. 35 years pass by while the family remains in their underground home. Eventually, their supplies wear thin and they decide Adam could venture out to see if it is safe and to retrieve the supplies they need. Adam ventures out into the world which appears very interesting and exciting to him. The problem is that all of Adam's references are dated to the time his parents had lived above ground, which was 35 years earlier. When dealing with other people Adam often makes errors in connecting the meanings behind the words people use. He also meets a young girl named Eve, who is played by Alicia Silverstone. Adam enlists Eve's help in trying to find all of the items on the list his mother gave him. The comedic innocence with which Adam encounters new people and new experiences adds charm to the overall story. 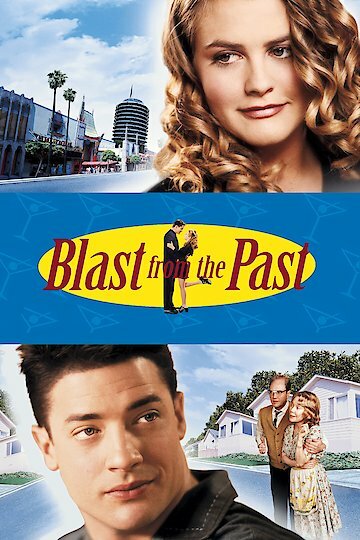 Blast from the Past is currently available to watch and stream, download, buy on demand at Hulu, Amazon, Vudu, Google Play, FandangoNow, iTunes, YouTube VOD online.